CrackBerry Asks: Do you think the Reduced/SureType keyboard should be an available layout on BlackBerry 10 phones? Do you think SureType (Reduced) should be an available keyboard layout on BlackBerry 10 phones? As you might well imagine, the topic of BlackBerry 10 gets discussed a lot these days in the CrackBerry offices. What will be there at launch? Will anything be missing? What features do we want to see the most? In one recent conversation between Adam and myself, we started talking about touchscreen keyboards, and we got to wondering if we'll ever see SureType a.k.a. the Reduced Keyboard option on touchscreen BlackBerry 10 phones. 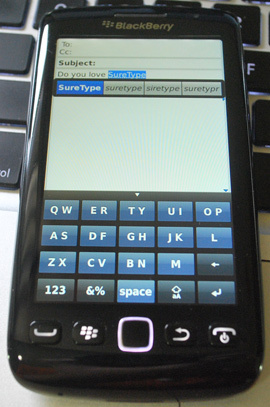 If you're not familiar with SureType, it's a keyboard configuration that was introduced on the BlackBerry 7100 series and popularized by the BlackBerry Pearl, which puts two letters onto a single key and makes heavy use of predictive text to help complete words. It allows you to put a full keyboard into the same space as a T9 keyboard, but type much faster. Believe me, there are a lot of old SureType addicts out there who can type faster and with more accuracy on SureType than they even can on a full physical qwerty. Question of the Week: Do you think the Reduced/SureType keyboard should be an available keyboard layout on full touchscreen BlackBerry 10 phones? Vote on the poll above and sound off in the comments!